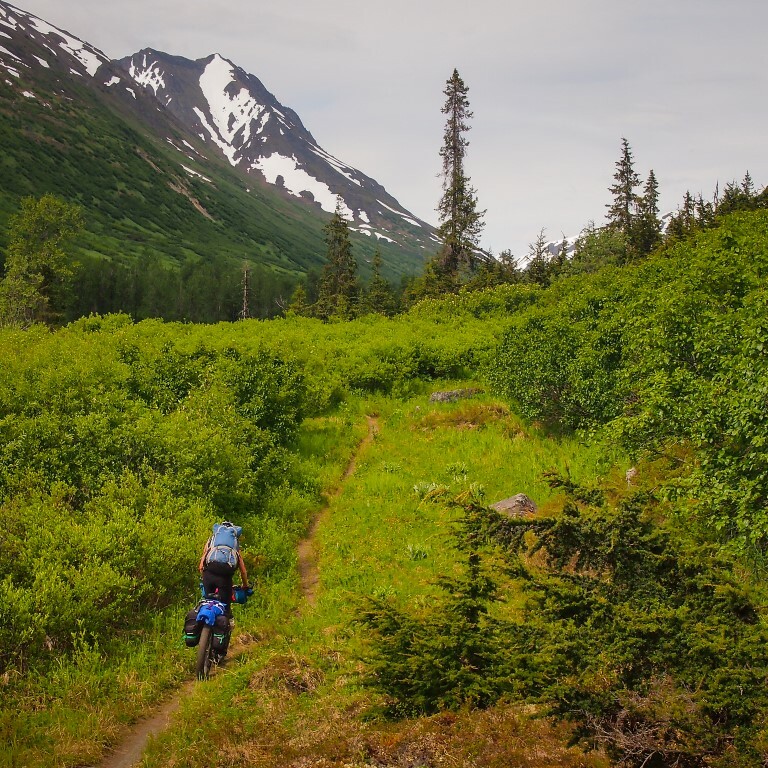 When Lisa and I were planning our Alaska trip, one of the must do’s on our list was to check out the bikepacking routes on the Kenai Peninsula, specifically Resurrection Pass, Russian Lakes Trail, and Johnson Pass. 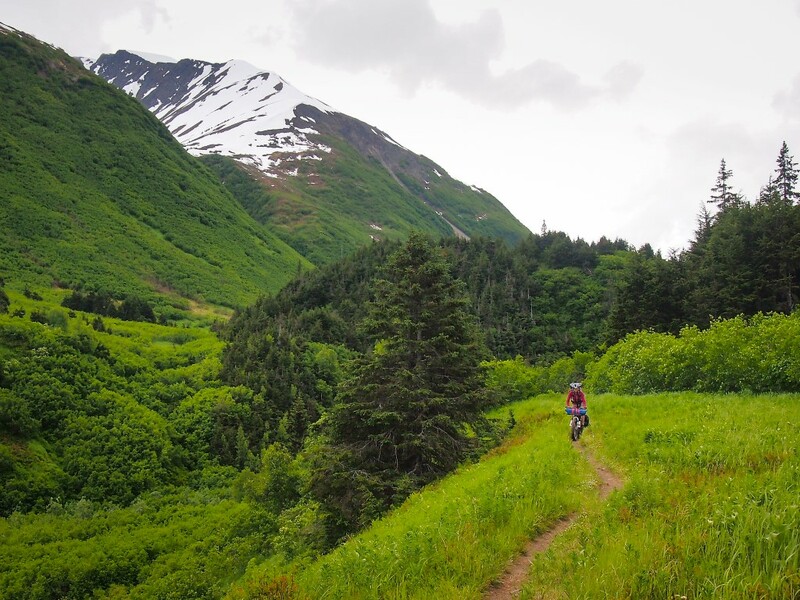 While the trailheads for these routes are easily accessible, the trails go deep into the Chugach National Forest and combined, they form 83 miles of awesome wilderness singletrack riding. 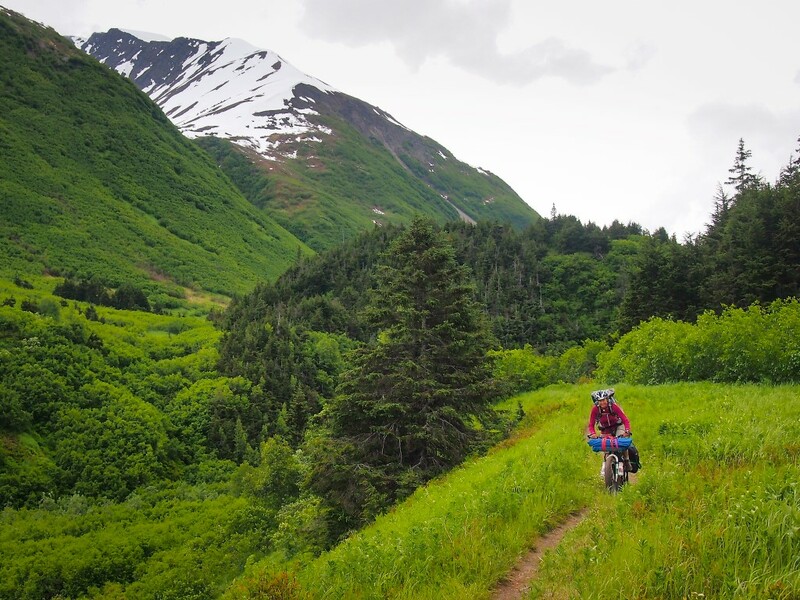 We linked these trails up with some bikerafting and beachpacking, but to ride them as a loop, park at the north trailhead for the Johnson Pass Trail, at mile 64 of the Seward Highway and at the end of the bike path descending south from Turnagain Pass. 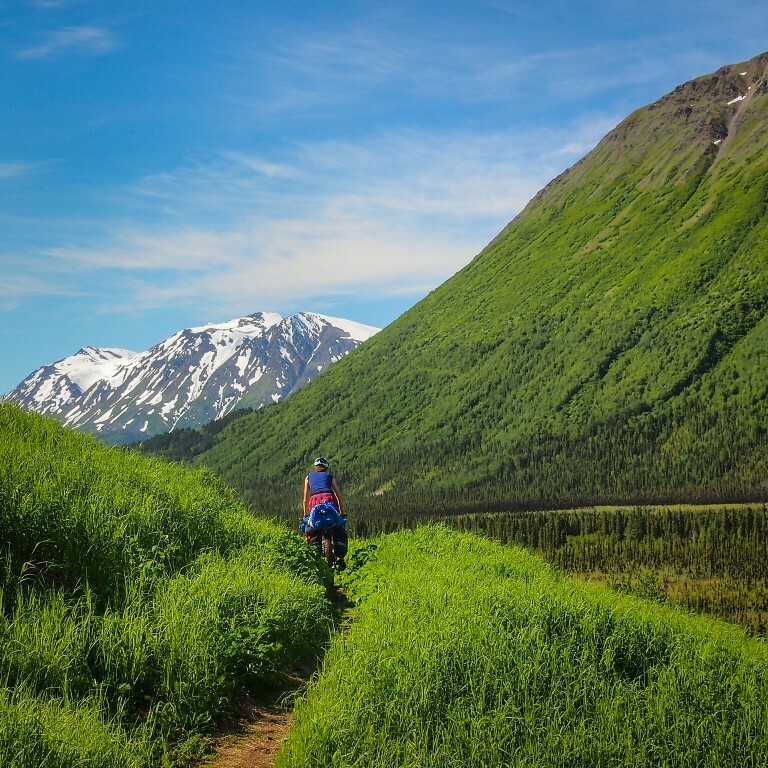 From here you can ride counterclockwise, heading south on the Johnson Pass Trail, or ride 25 highway miles to Hope and the start of the Resurrection Pass Trail, which is the option we chose. 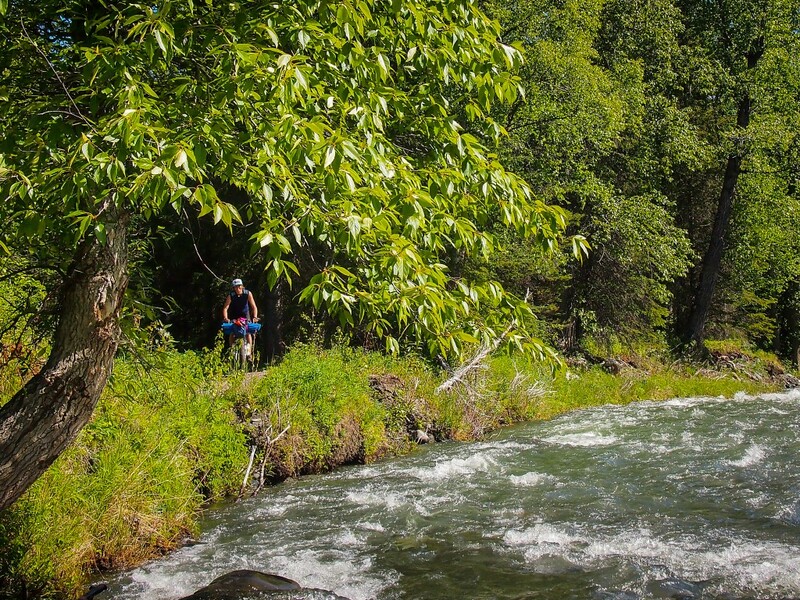 Hope is a tiny, former gold rush town turned off the beaten track tourist destination. It has a new age vibe and if you’re lucky, you may catch some live music, but with only around 150 residents you may also see hardly a soul. 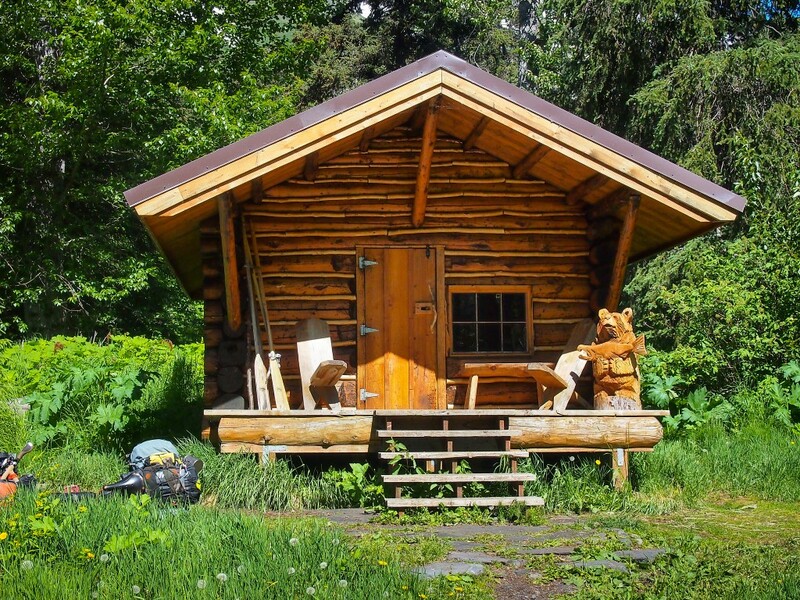 Also, don’t expect much for supplies, but for in-town camping options the Seaview Café also has RV spots, test sites, and cabins available, and there is the USFS Porcupine Campground just out of town at the end of the Hope Highway. 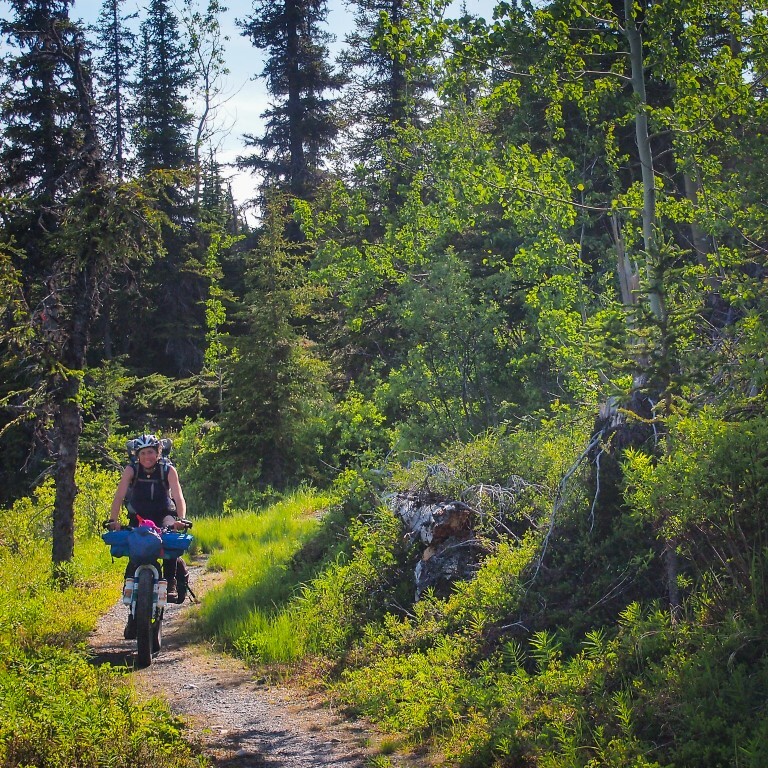 After filling up our water bottles, we headed south on Resurrection Creek Road and pedaled four dirt road miles to the trailhead. 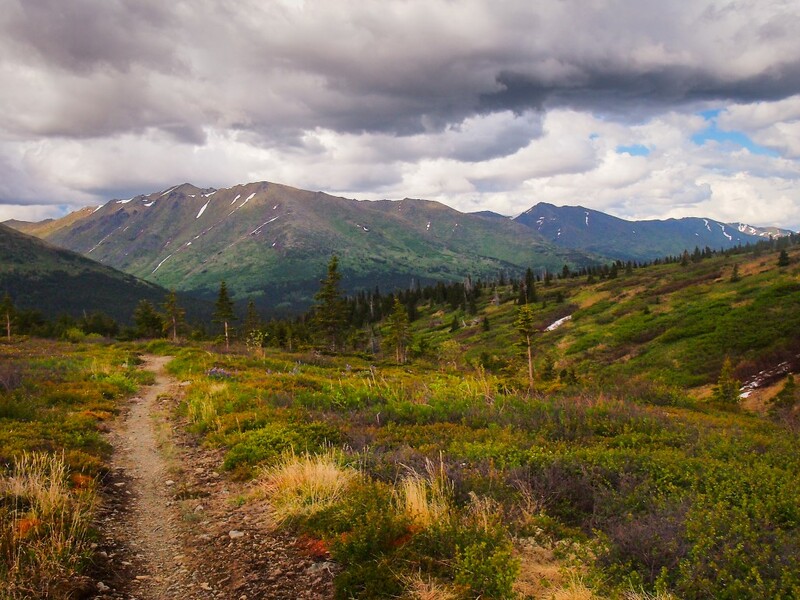 From there the Resurrection Pass Trail climbs for 17 miles, following Resurrection Creek while winding its way through spruce and pine forest, past gold mining claims, until it tops out in a high alpine valley. While the climbing is from almost sea level to a 2,600 foot crest, its gradual and the trail is well maintained. Even with overloaded fatbikes, most all of it was rideable, if it wasn’t covered in snow. 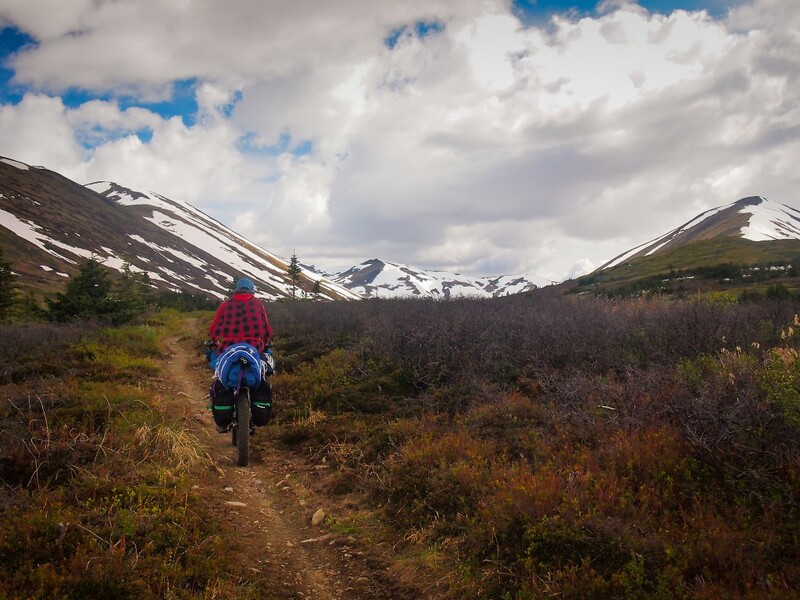 After riding or pushing over Resurrection Pass, you are rewarded with rolling alpine singletrack that gradually descends to Highway 1 and the town of Cooper Landing. 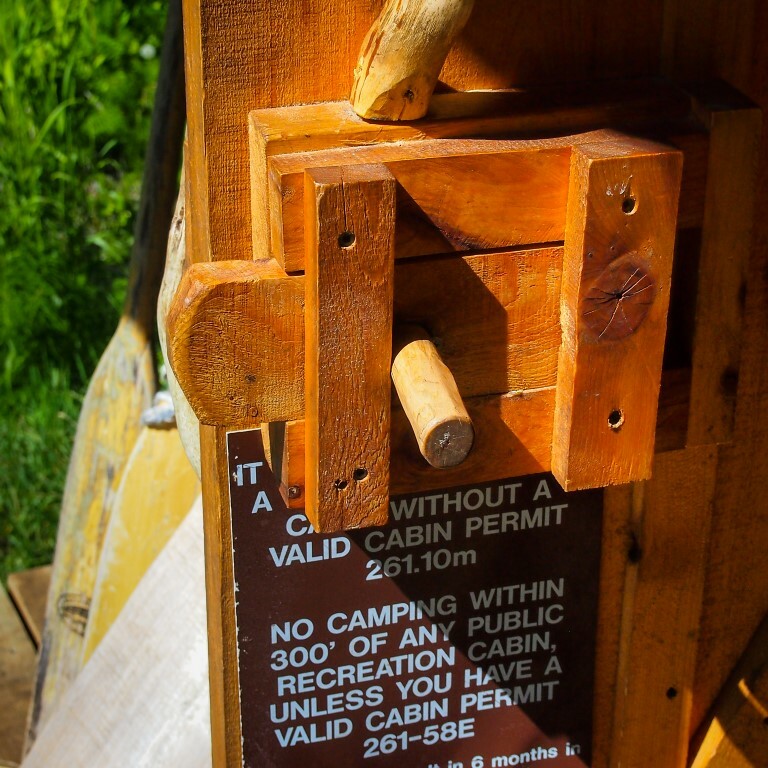 Along the way there are eight public use cabins (by reservation), 19 campsites, and endless amazing views. 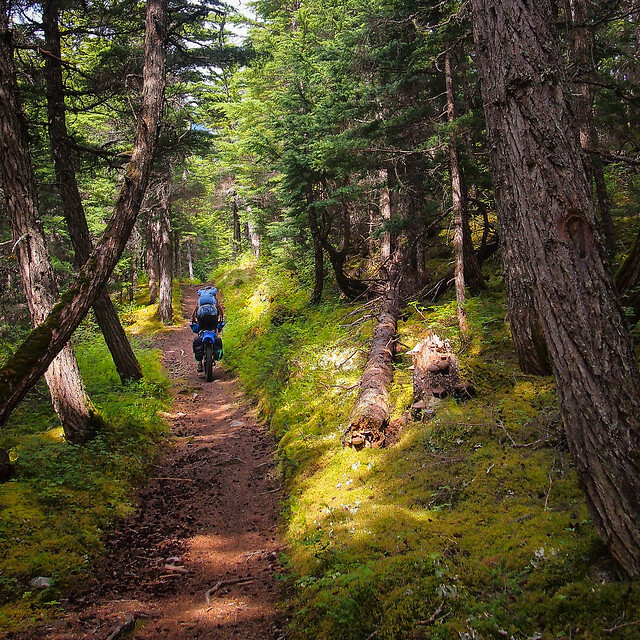 The Resurrection Pass Trail starts off wide, but the higher you climb the narrower it gets. While the trail is usually closed to motorized traffic, every other winter its open to snowmobiles. Even with the low snow year and our June 1st start, we were about a week early at Resurrection Pass. This perfectly maintained ribbon of singletrack is about 10 miles from the nearest road. 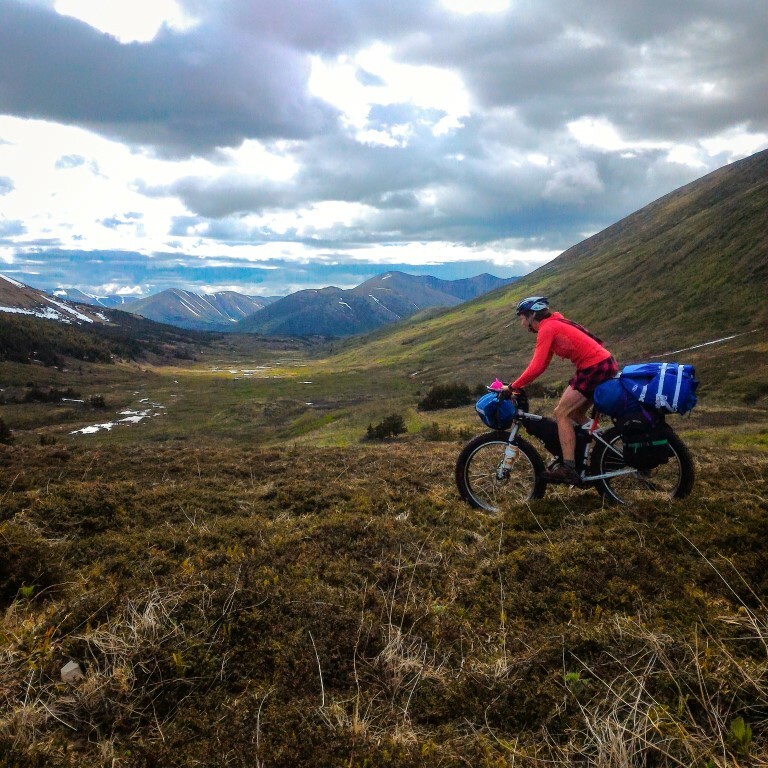 After a snack resupply / phone charging / Instagram session at Wildman’s, the hub of Cooper Landing, Lisa and I took a detour and headed west, to ride the beach from Nikiski to Homer, and then came back east to ride the Russian Lakes Trail. 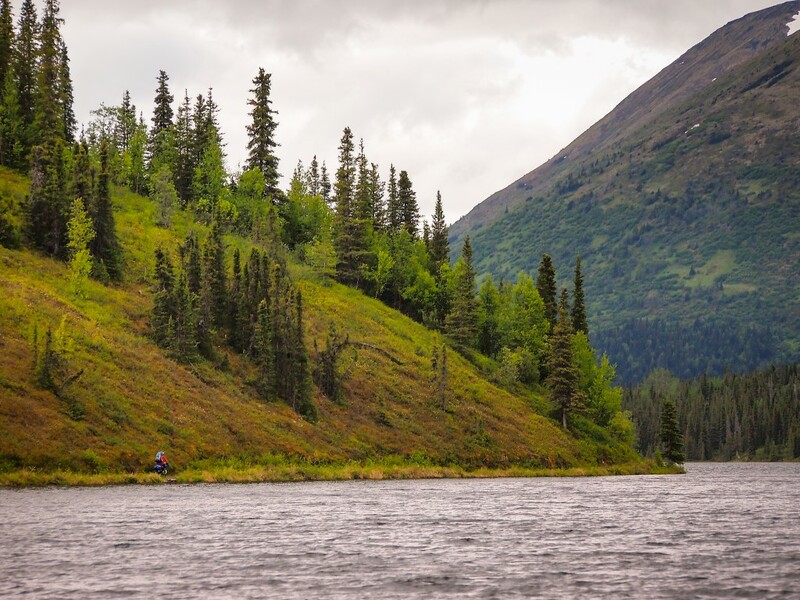 Without the detour, turn left from the Resurrection Pass Trail parking area onto the Sterling Highway and ride about ½ a mile, crossing the Kenai River, to the Russian River Campground road; the Russian Lakes trailhead is about one mile up the road. 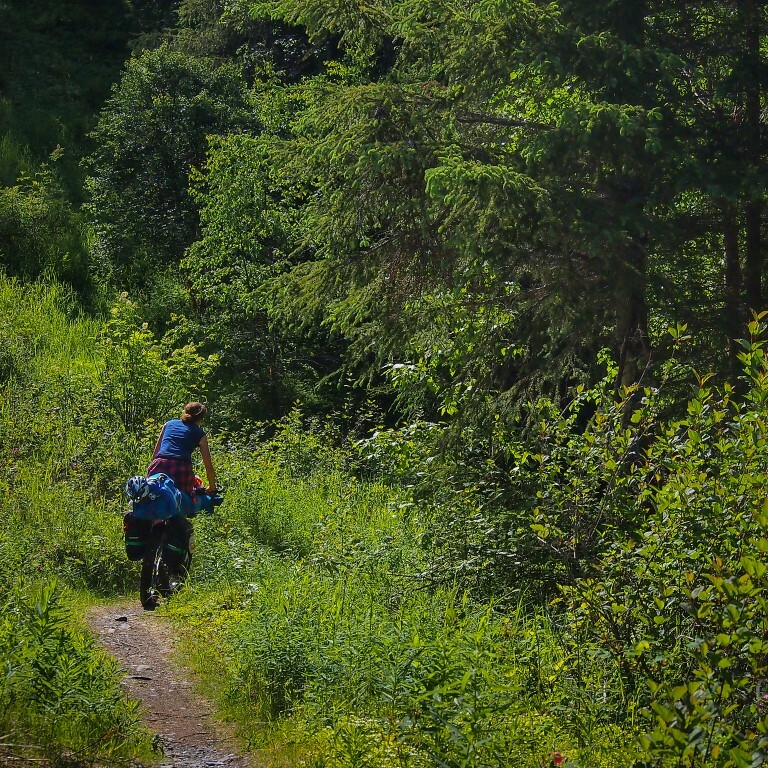 From the campground the trail climbs gradually, following the Russian River through dense forest, brushy hillsides, wide open views, and past lower and upper Russian Lakes. There are three public use cabins (also by reservation), five campsites, and lots of dispersed camping along this stretch of the trail. 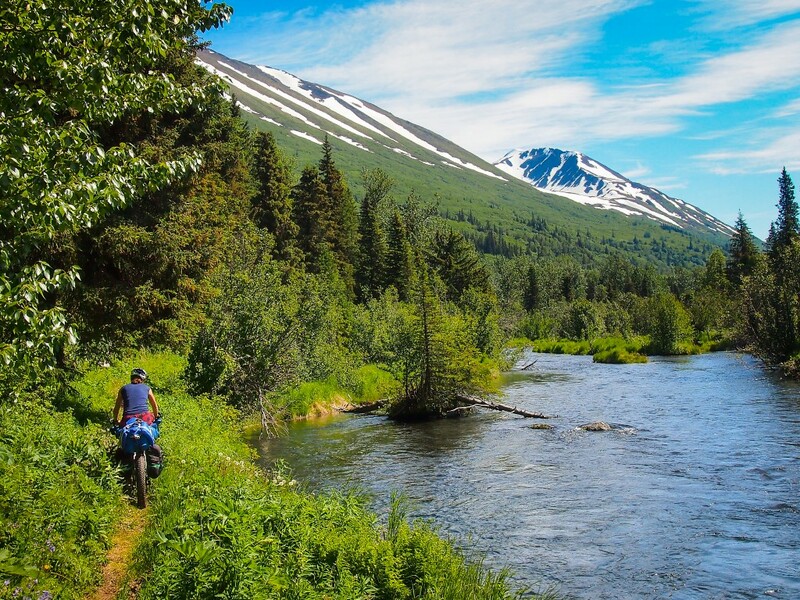 From here the trail rolls upward, wrapping around Cooper Mountain to the head of Cooper Lake, then down to Snug Harbor Road and 12 more miles of dirt road riding back to the Sterling Highway. 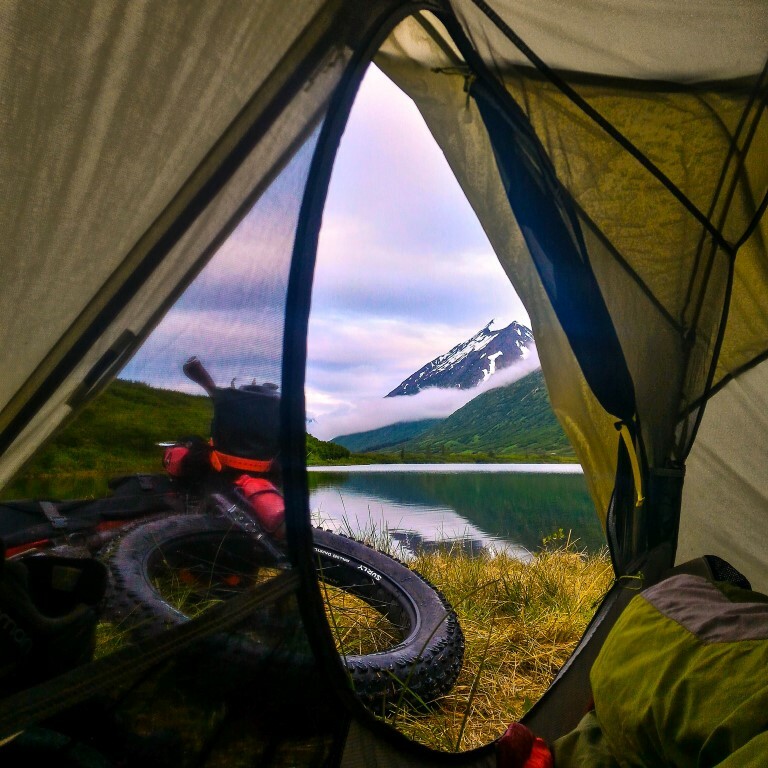 If you hit this stretch late in the day, there’s some pretty good camping along the shore of Kenai Lake. 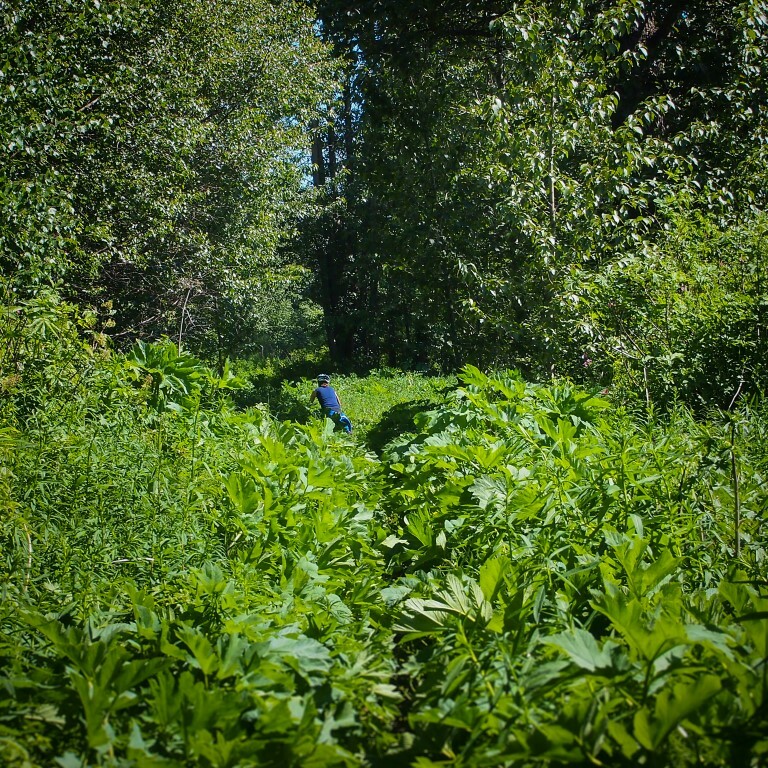 The Russian Lakes Trail doesn’t see the traffic of Resurrection Pass, and the foliage is pretty dense in sections. 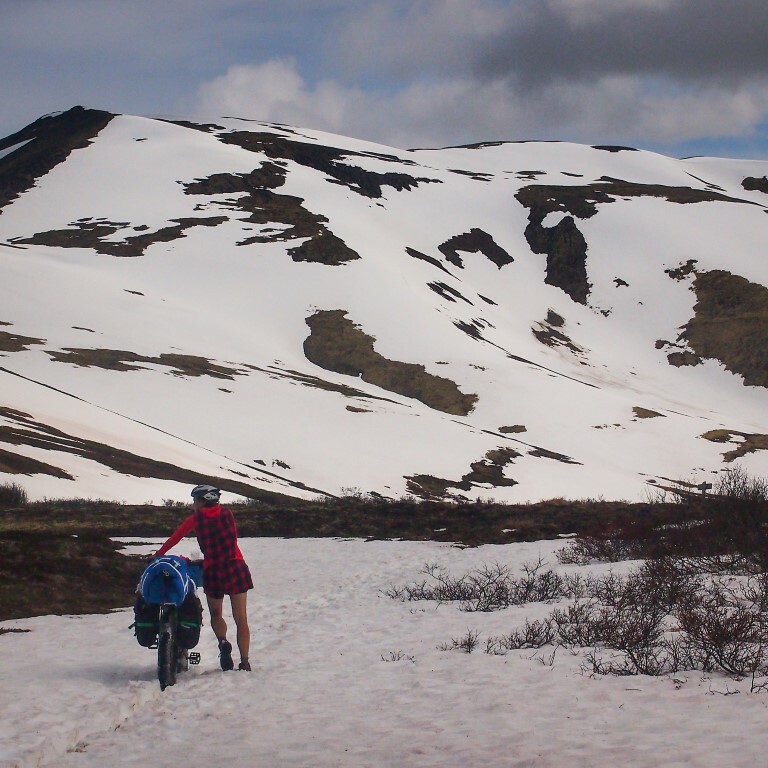 If you’re too early in the season you’ll find snow, too late and the brush will have overtaken the trail. Also, keep in mind that anytime you ride it, you’re in bear country and you should be making some noise – nobody wants any surprises. 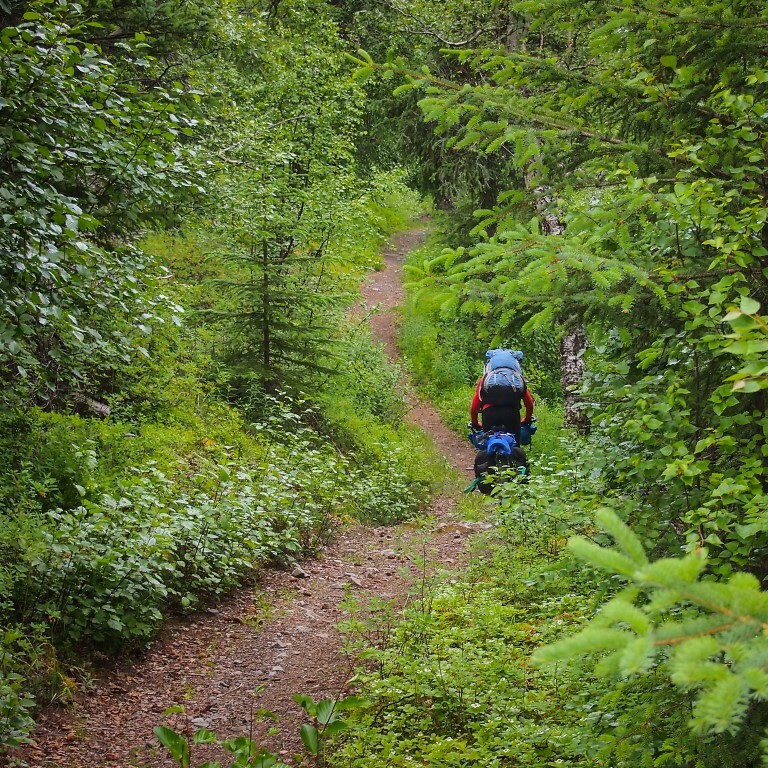 Out of the three trails, this one definitely had us the most bear aware. Lots of grassy hillsides, unbroken except for the narrow ribbon of singletrack. 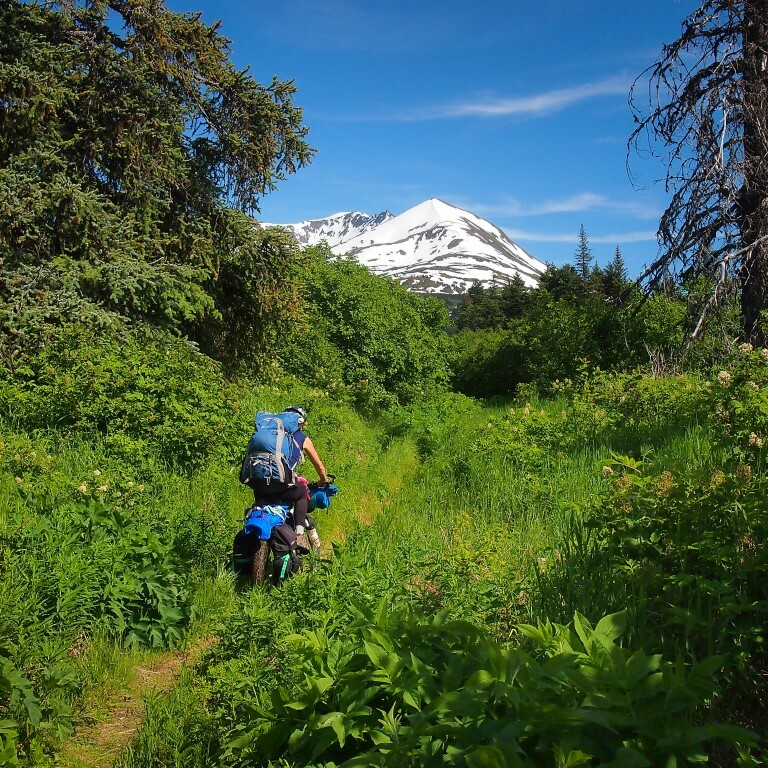 Conveniently, Snug Harbor Road meets the Sterling Highway about ½ a mile from Wildman’s, the down side is there is still 15 miles of pavement to get to the south trailhead for Johnson Pass. 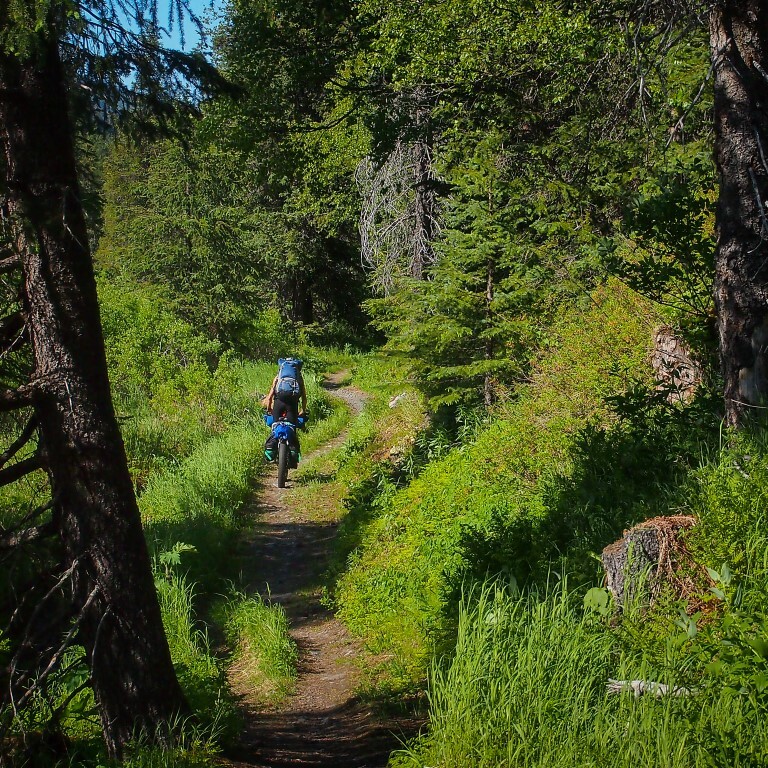 Once you get there, the first five miles of trail are pretty gradual as it follows a well maintained path along Johnson Creek and through dense forest. From here things get a bit more rolling, with a few punchy climbs, until breaking out of the forest and into the subalpine bush. 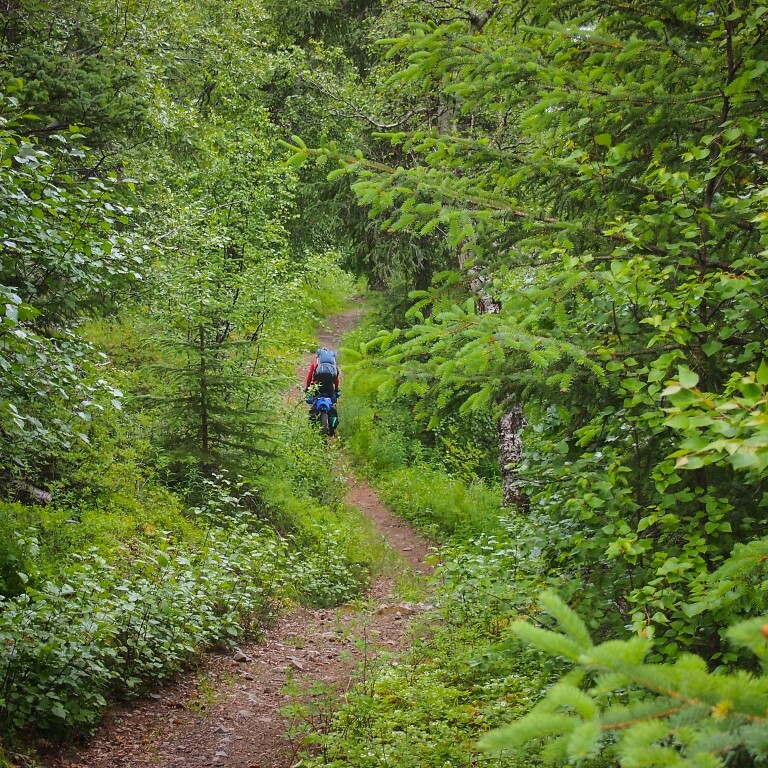 Like the Russian Lakes Trail, the foliage is pretty dense and by the end of June the trail gets pretty schwacky. 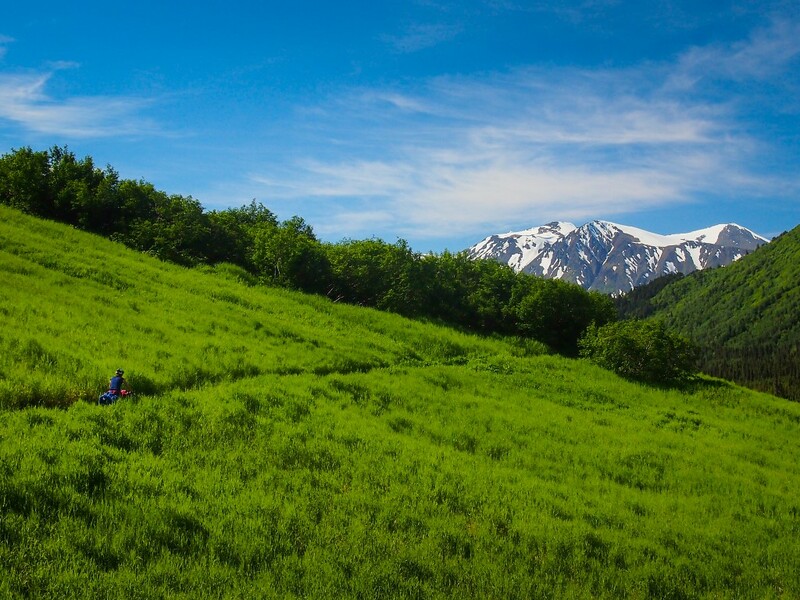 When the climbing finally stops, the great views begin, and if you’re planning on spending the night, so does the great camping. 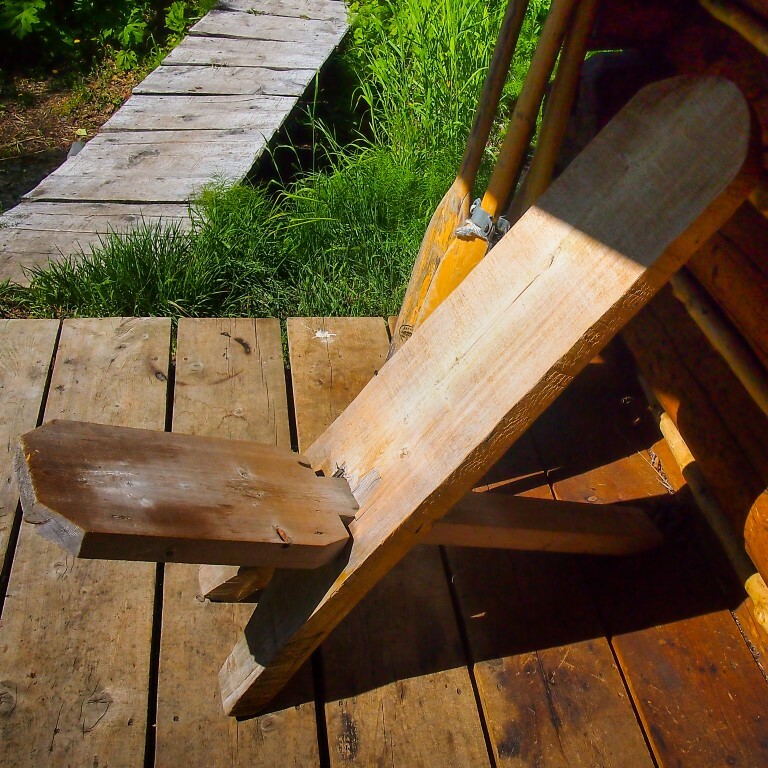 There are tent sites with a food locker on Johnson Lake and a few dispersed camping spots on Bench Lake – take your pick. When you wake up the real fun begin, an almost ten mile descent to the north trailhead. Stream crossings, rock gardens, dips, and rollers, there’s a bit of everything on the way down. Keep in mind though, it seems most people ride and hike this trail from the north, so watch out for traffic. Bench Lake was unquestionably the best camping spot we had on the whole trip. 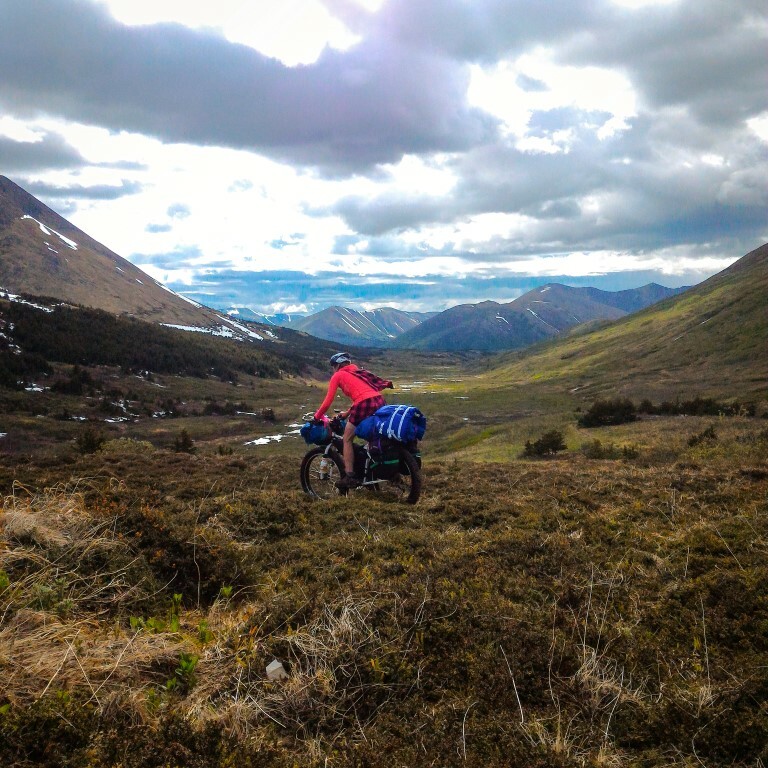 Lisa and I both rode Surly Pugsleys, with Old Man Mountain Sherpa rear racks, Defiant Zipperless Frame Bags, and an assortment of packs and panniers. 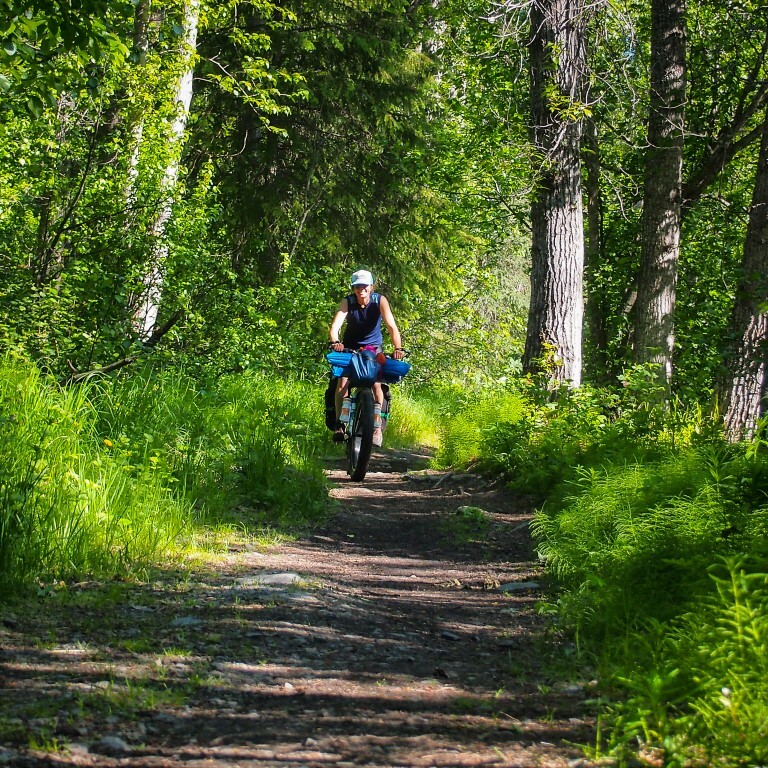 While fatbikes are sluggish on pavement, for loaded trail riding they are absolutely awesome. The traction while climbing over rocks and roots is unparalleled and when the trail turns downward, the fat tires really take the edge off sharp bumps. There is one downside though, the wide Q-factor combined with platform pedals created a few pedal strikes while riding dished out ribbons of singletrack. Also, when it comes to adjusting air pressure, there’s a fine line between mushy and squirmy and bouncing like a basketball. 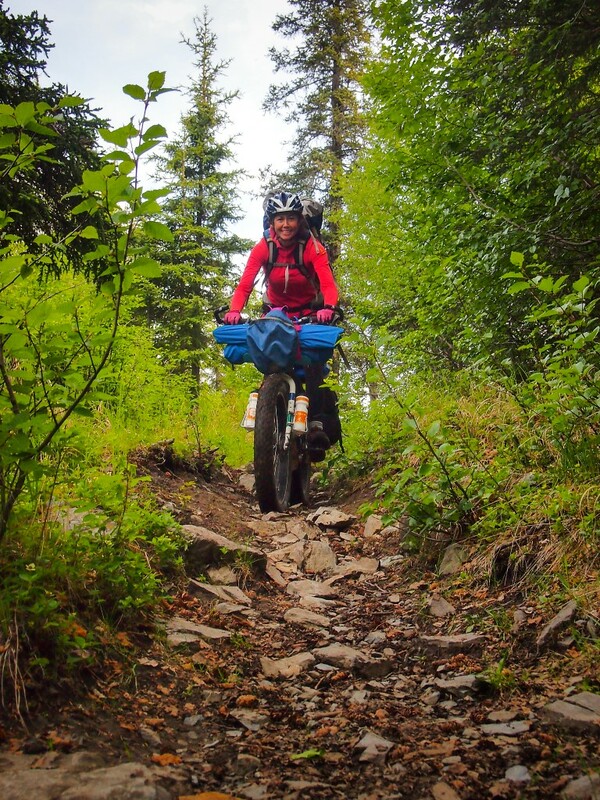 For packing, we both carried lightweight, full size backpacks and they usually stayed on the rear racks, but when the trails got rough we would wear them loaded with the gear from our panniers. 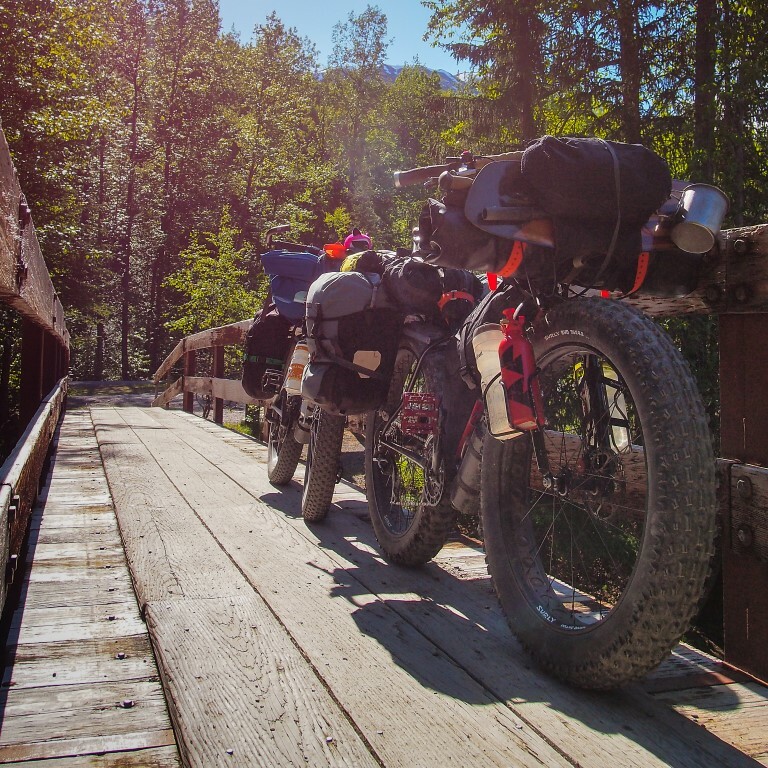 We never removed our packrafts from the front of the bikes, which helped dampen the steering, or emptied our frame bags, which contained mostly food, but unloading the rear really livened up the ride and reduced some of the beating the bikes were taking. For navigating, we carried pages 70 and 71 from the DeLorme Alaska Atlas & Gazetteer and used the apps Maps.me and Gaia GPS on our phones. 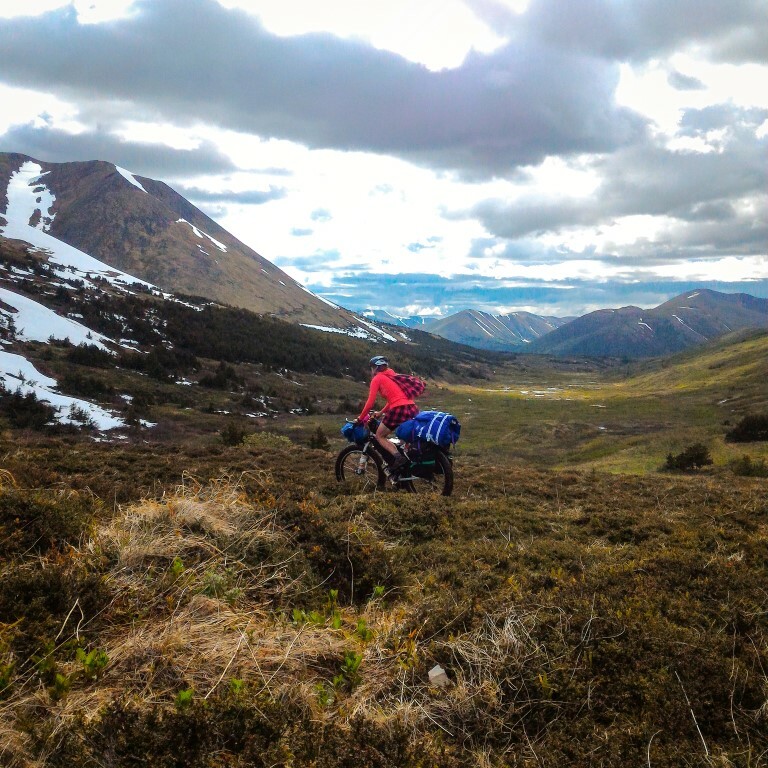 For route information and GPS tracks, the website for the Kenai 250 bikepacking race has the best information and is where I first learned about these trails. To convert the GPX files to a phone friendly KML format, GPX2KML is the site I use. 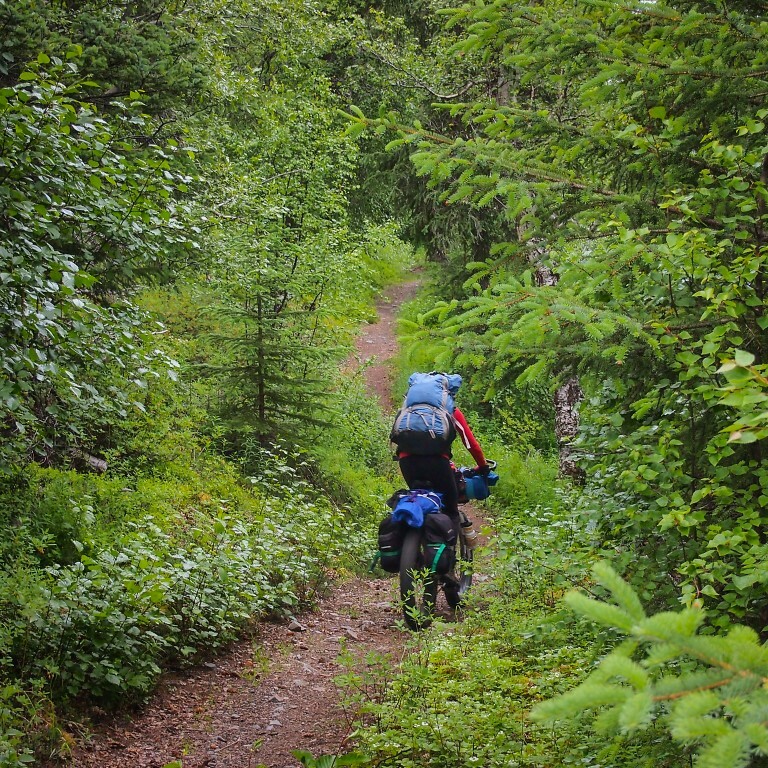 One last note – these trails are really remote and if you end up needing help, it’s a long way away. There are no shortcuts back to the road or bypasses to shorten the ride, the only options are turn around or ride until the end. And no, there is no cell reception, so plan accordingly and remember the Scouts Motto. How do think 29+ with 3.0 using a Bluto would fare on this route? I think it may be the ultimate combination. Aired down you could even ride much of the beach route with it. 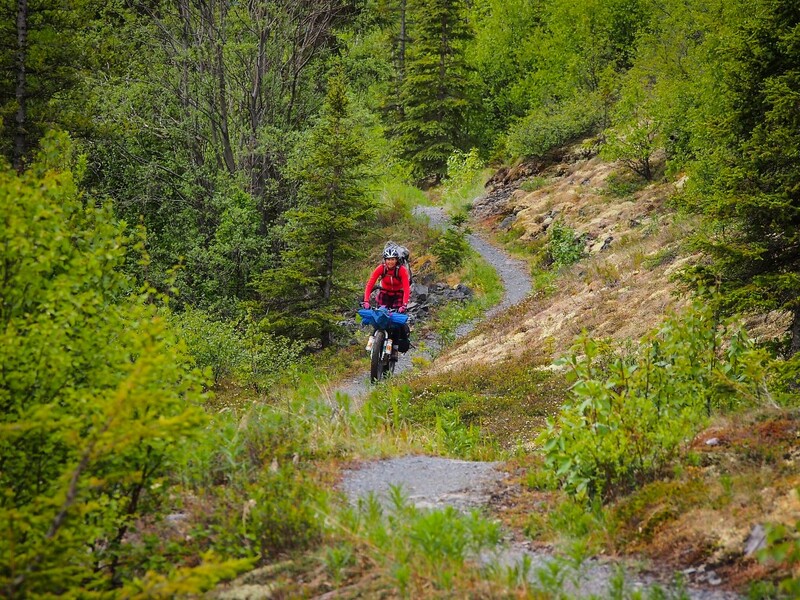 The Pugsley was overkill for these trails, but it was great on the muddy ATV trails further north.